If you’ve been following my blog for a while, you probably know that I absolutely LOVE healthy fast food. This means vegan burgers & co that are made with fresh and healthy ingredients instead of meat, white flour, lots of flavor enhancers, and a couple of pathetic-looking cucumbers and half-faded lettuce. The burgers we have are usually packed with tons of nutrients, veggies, and lots of spices like this vegan chickpea quinoa power burger. It really deserves its name as a “power burger”. Besides quinoa and chickpeas it contains lots of fresh vegetables like mushrooms, red bell pepper, celery, and carrots. I also used garlic, a red onion, lots of spices, mustard, and liquid smoke, which is, however, optional but really gives the veggie burgers a great smoky taste. Quinoa is super healthy and we have it at least once or twice a week. It’s packed with protein, fiber, vitamins, and minerals. It contains 50% more iron than wheat and is also rich in calcium. 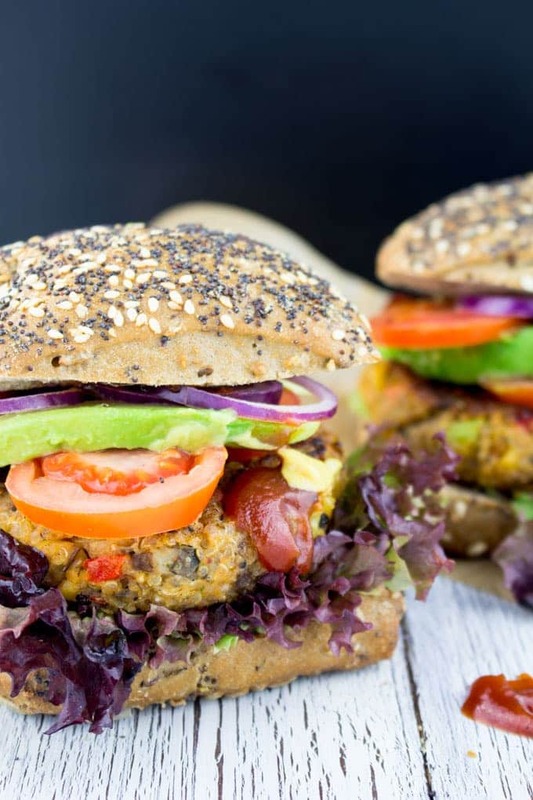 Besides its protein is high in essential amino acids, so it really is the perfect garnish or even the main part of a meal like in these vegan quinoa burgers. Plus, quinoa is gluten-free and easy to digest. So what is there not to love about quinoa, right?! We topped the chickpea quinoa power burger off with some tomato and avocado slices, lettuce, BBQ sauce, and some mustard. To make them stick together, I used two teaspoons of carob gum powder. If you can’t find it, guar gum works as well. You can also leave it out and the burgers will still be great, just a bit softer. If you’re looking for more ideas on how to use quinoa, check out these 40 vegetarian quinoa recipes by Kiersten from Oh My Veggies. I also love using quinoa for salads and bowls. This chickpea quinoa burger is one of our favorite burgers right now! I think we had it like three times over the last two weeks. And of these two weeks we were on a trip to Amsterdam for 5 days during which we didn’t cook much, so you clearly see how much we like it. Haha! We also had some great vegan food on our trip to the Netherlands. It’s super easy to find vegan food there. I had some people asking me on Instagram how I knew where to look for vegan restaurants and one girl even said that she had such a hard time in Amsterdam because she didn’t find anything vegan. I usually use an app called Happy Cow on all my trips. It’s also accessible online without the app and it shows you all vegan, vegetarian, and veggie-friendly restaurants world-wide. It also gives you a map with all the restaurants, just like Google maps, which makes it super easy to use. I travel a lot and I’ve already used it on several trips to the U.S., Canada, Asia, and Europe and it always works really well. I also really loved the colorful tulips that were just EVERYWHERE all over Amsterdam! Unfortunately the trees just began to turn green again and we were a bit early, but April is the best season to see all these beautiful Dutch tulips. This chickpea quinoa power burger really deserves its name! It's packed with lots of protein, healthy veggies, and flavor. Vegan fast food at its best! 2 teaspoons guar gum or carob gum If you can't find it, you can also leave it out and the burgers will still be great, just a bit softer. Cook the quinoa according to the instructions on the package. Use vegetable broth instead of water. Set aside. Rinse and drain the chickpeas. Mash with a fork. Leave some of the chickpeas still intact for texture. In a large pan, heat some oil and sauté the onions for about 2 minutes. Add the garlic and cook for another minute. Then add the red bell pepper, the celery, the mushrooms, and the carrots and cook for about 3-4 minutes. In a large bowl combine the quinoa, the mashed chickpeas, the flax egg, and the cooked veggies. Add the spices, the mustard, guar gum, salt, pepper, and if using the liquid smoke and red pepper flakes and stir well. Form 4 patties and heat some oil in a large pan. Cook the patties for about 3 minutes on each side until golden. Serve on whole wheat buns and top them off with tomatoes, avocados, lettuce, BBQ sauce, and mustard. Those sure are power burgers! You packed in just about everything you could ever want! I always love a good vegan burger and these look like they’d be full of so much flavor! I’m always on the lookout for a good veggie burger. Pinned this one. Thanks! This is a great burger, and yes I agree, it deserves the term power because there’s so many great ingredients in here and it’s bound to help you get through your day! Chickpeas are the best! These look SO delicious! I LOVE veggie burgers! I would pretty much eat any kind out there. These look so flavorful and delicious. Pass me a few! These are beautiful, the way you styled them and those super seedy buns! I get really excited about burgers with tons of flecks of color in them because that means lots of veggie goodness packed inside! As if chickpeas and quinoa wasn’t already powerful and tasty enough, the mushrooms and carrots and celery make these a little self contained perfect meal! Tulips everywhere!? Do you have pics, that sounds lovely! Loved your ingredient and i agree this is powerful with so much flavor! Looks so delicious and i will try this soon and let you know! This burger is as colorful as the fields of tulips in Holland. :) I love the ingredients in this healthy burger, and I would love to go to the places you went to on your trip. Sounds perfect. What a lot of flavour you’ve packed into these gorgeous burgers! They sound and look delicious. You can’t beat a good good veggie burger! Nothing satisfies like a veggie burger. The combination of quinoa and chickpeas sounds great. I could really use one of these right now! Glad you like them, Howie! Did you grill these? How did they turn out? That is my kind of burger! love quinoa and chickpeas especially the combination in a burger patty! Wow! Now that’s one good looking power burger! I can’t wait to make this at a summer bbq! I cannot wait to try this recipe, but I do have a question. This will be my first time cooking with mushrooms. Is there a certain mushroom you recommend? The produce aisle carries so many varieties and shapes of mushrooms I usually stay clear of them. I was not a huge fan of mushrooms growing up, but as I got older I realized they usually take on the flavor of the dish. Also, if you have any tips and tricks on mushrooms please include them for me. I made this recipe today. I had to skip the Tbyme because I had none, and at the last second I realized I had no chickpeas, and so I subbed Great Northern Beans. Also, I used fresh Basil. These are TO DIE FOR. Seriously, my mouth wanted to keep eating and eating and eating them. We are definitely going to put this into our regular rotation. Thank you for such an awesome recipe!!!! I’m hoping to make these today, so I realize, not much of a chance of getting an answer, but worth a try. The quinoa 1/2 cup cooked, does that mean measure the 1/2 cup after cooking or cook 1/2 Cup of quinoa which of course would yield more than 1/2 cup? Right now I’m leaning toward cooking the quinoa and then measuring. Hi Leslie, I’m so sorry for the confusion! You’re right that really is a bit unclear. It means cook 1/2 cup of quinoa (measuring before cooking). Let me know how you liked them. :-) Have a great Sunday! Wow, thanks for getting back so quickly. I think I have too many veggies in them, they are falling apart and there’s a lot more than 4 burgers (that’s the one I used). Perhaps if you could measure the chopped veggies by the cup to tweak this a bit. I haven’t fried them yet, but I don’t think they are going to flip over very easily. I’m wondering about next time chilling the mixture first, or pre-baking? Have you tried either? I think they’ll taste great but may be more like a “loose” burger than a patty when done. Those buns! What brand are they? Where do you find them? Hi Chad, I’m sorry about that! I just updated the recipe.